For lots of kids, going to the doctor can be a traumatizing experience. The room is usually cold and sterile; they’re poked and prodded and forced to say “Ahh”; and often, the trip includes some scary needle pricks. But every so often, you have a doctor or nurse who just has the magic touch! They know how to calm your child down and even make the visit fun! These types of medical professionals are a life-saver for parents who are often just as nervous as their kids. No loving parent likes to see their child afraid or hurt! Well, it appears this nurse knows the way right into her young patients’ hearts! This adorable little guy was at the doctor for his 9-month checkup. When the nurse first began to listen to his heartbeat, he looked a little unsure. Who was this woman pressing the cold listening device against his bare chest? But after some coos and smiles and a little tickle, the nurse won his heart over. If this is the way this precious baby acts around all women, he’s going to be a little lady-killer! 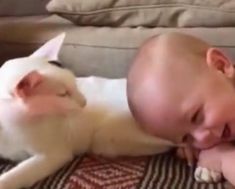 It’s so sweet to see the precious bond that so quickly formed between this baby and his nurse. Hopefully it’s one that will continue – then doctor visits will be a pleasure instead of a pain!